York, N.Y., has announced the elec- tion of Franklin W.L. Tsao as a di- rector to its hoard and the forma- tion of an affiliated company, Ship- central, Limited, New York, of which Mr. Tsao is the president. Peter Burbank, John R. Sheffield, and Franklin W.L. Tsao. States and Europe. Included, have been numerous types of specialized bulkcarriers, super, very large (VLGC) and ultra large (ULCC) tankers, large liquefied gas carriers, and products carriers for which, in most cases, customized charters were arranged. Shipcentral will fur- ther emphasize the above services, together with expansion into other related services for shipowners. Co., Inc., Westboro, Mass., has an- nounced the appointment of Ar- mand D. Bouchard to the position of manager of marine sales. The 519 Radiofacsimile System is designed to be used 'by ships at sea and offshore drilling platforms to receive various weather charts de- picting data on atmospheric and wind conditions, sea conditions, storm movements, ice flows, etc. via radiofacsimile transmitters lo- cated around the world. Mr. Farrington pointed out that the marine industry is forecasted for significant growth in all areas, especially those related to the ener- gy crisis, such as oil tankers and offshore oil drilling platforms. Texas, has announced that H.E. Whalen has joined the firm as man- ager of operations and will make his headquarters at the company's offices in Morgan City, La. Mr. Whalen received his B.S. de- gree in petroleum and geological engineering from Texas A&M Uni- versity. For the past two years, he was Southeast Asia operations manager for Teledyne Mobile Off- shore in Singapore. Previously, Mr.
Whalen was an engineer with Ten- neco Oil Company and supervised the drilling of offshore wells. If you think the initial savings are good, you'll think the ongoing savings are great! The rising cost of gas-line fuel. 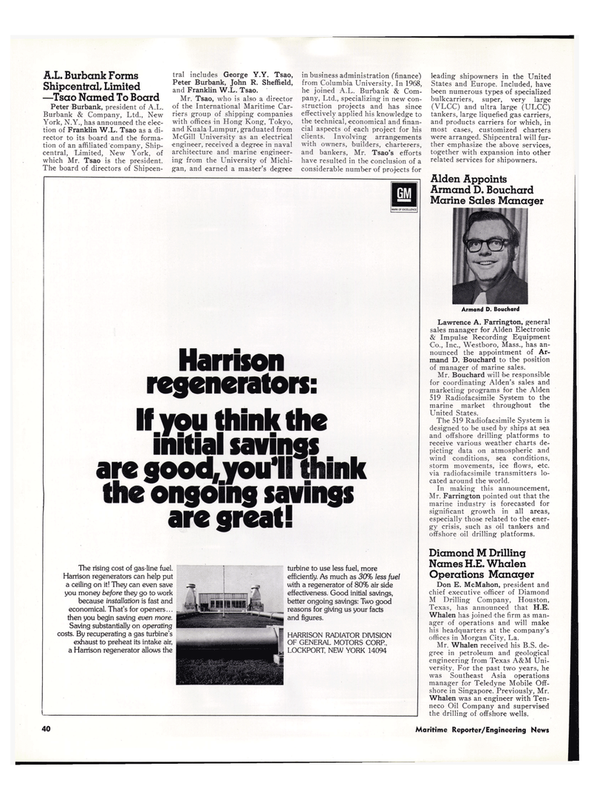 Harrison regenerators can help put a ceiling on it! They can even save you money before they go to work because installation is fast and economical. That's for openers... then you begin saving even more. Saving substantially on operating costs. By recuperating a gas turbine's exhaust to preheat its intake air, a Harrison regenerator allows the turbine to use less fuel, more efficiently. As much as 30% less fuel with a regenerator of 80% air side effectiveness. Good initial savings, better ongoing savings: Two good reasons for giving us your facts and figures.